Conversational Leadership recognizes the extraordinary but underutilized power of face-to-face conversation and takes a conversational approach to the way in which we live and work together. We abide in a hyper-connected, complex world. Our old command and control, hierarchical ways are no longer effective. Conversational Leadership is a powerful response. We need to discover innovative ways in which to interact and work with each other. 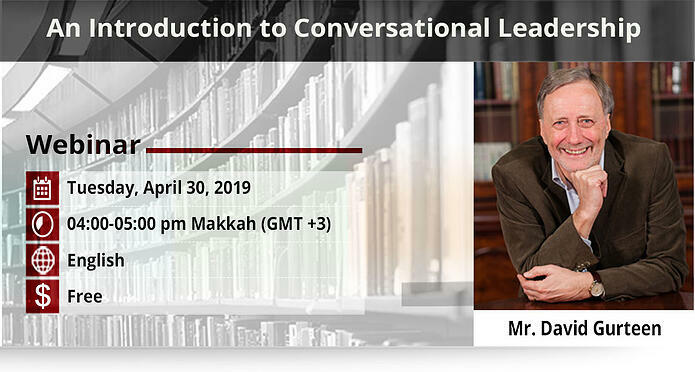 The webinar is for anyone interested in becoming a conversational leader. Places are limited. Early registration guarantees a place. Registration will close when the available places are booked. Successful registrants will receive a confirmation message with the webinar link. Creator of the Gurteen Knowledge Café. Facilitated Knowledge Cafés in over 30 countries around the world for the last 15 years. Naseej Academy is a not-for-profit initiative from Naseej (www.naseej.com), created to support and develop knowledge and information professionals, and the knowledge community in the Arab world, by offering a wide range of programs, courses, workshops in cooperation with renowned local, regional and international organizations.